ELON Musk faced one of his biggest tests yet today, and he passed with flying colours. This morning SpaceX launched its monster rocket, the Falcon Heavy on a historical test flight. The rocket is the most powerful in operation today by a factor of two and is designed to one day take supplies to the Moon or even Mars. The last time we launched a rocket this powerful was for the Apollo missions. Musk himself put the likelihood of success at 50/50, admitting there was every chance the rocket could instantly explode in to a ball of flames at takeoff. "It is guaranteed to be exciting, one way or another," the 46-year-old space visionary and wealthy businessman told reporters on the eve of the launch. "I would consider it a win if it just clears the pad and doesn't blow the pad to smithereens," he added. 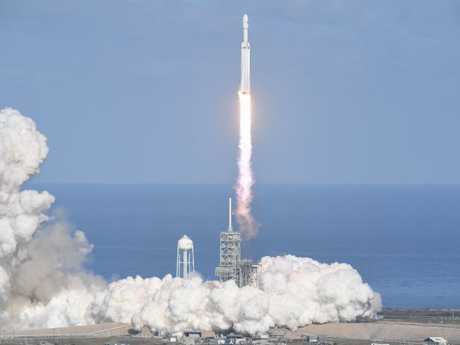 But at 7:45am this morning AEST the rocket took off from its Florida launch pad to rousing applause from the thousands jammed on surrounding beaches, bridges and roads to watch the launch. 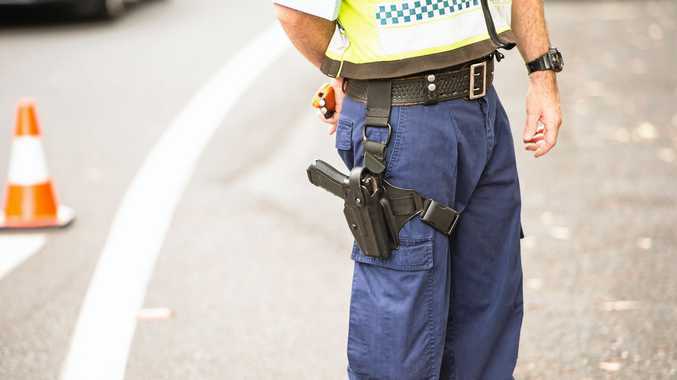 "The vehicle is now supersonic," said a voice over the radio broadcast. About three minutes into flight the side boosters separated from the Falcon Heavy, marking a major moment for the successful flight and prompting more cheers from engineers on the ground. Two of the boosters were recycled and programmed to return for a simultaneous touchdown in the launch site while the third, brand new, set its sights on an ocean platform some 480 kilometres offshore. After reaching orbit, the rocket then returned and landed back on Earth completing a flawless and historical launch. SpaceX commentator John Innsbrucker said it was "everything you could want in a test flight." Elon Musk wants to help make humans an interplanetary species by colonising Mars and rockets like Falcon Heavy - which currently cost about $114 million per launch - are going to play a crucial part in that journey. 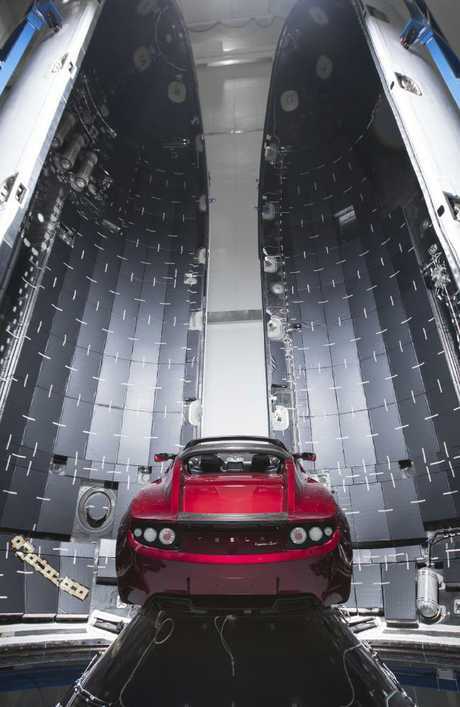 As a tongue in cheek pay to illustrate the point (and to help mimic a certain payload), on board the Falcon Heavy this morning was Musk's very own Tesla roadster with a mannequin in Space X's custom made spacesuit behind the wheel. After the successful flight, if the vehicle survives it is shooting for a solar orbit that will reach all the way to Mars. It's not everyday we get to watch a billionaire use a giant rocket to shoot his expensive electric car into orbit, but today was special. 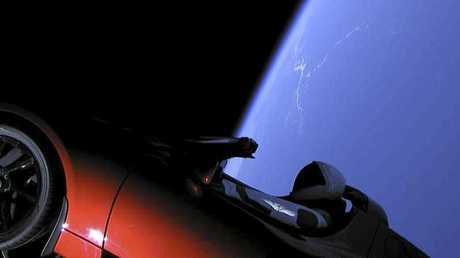 From on board cameras, the words "DON'T PANIC" could be seen on the dashboard of the vehicle as it floated in space, an apparent nod to the science fiction series the Hitchhiker's Guide to the Galaxy. Musk's’s Tesla car next to the fairing of a Falcon Heavy rocket in Cape Canaveral, Florida. The Falcon Heavy is essentially three smaller Falcon 9 rockets (which Space X has been vigorously testing over recent years) strapped together. As a result, the Falcon Heavy boasts a total of 27 engines. The 70-metre tall rocket is designed to carry nearly 64 metric tonnes into orbit - more than the mass of a fully loaded 737 jetliner. It was initially designed to restore the possibility of sending humans to the Moon or Mars, but those plans have shifted and now the Falcon Heavy is being considered mainly as a potential equipment carrier to these deep space destinations, Musk said this week. What is Elon Musk hiding? Flamethrowers: Has Elon Musk lost his mind?